A baby’s teeth begin coming in just a few months after birth—first one or two in the front, and then gradually the rest of them over the next couple of years. We often refer to these primary teeth as deciduous—just like trees of the same description that shed their leaves, a child’s primary teeth will all be gone by around puberty. It’s easy to think of them as “minor league,” while permanent teeth are the real superstars. But although they don’t last long, primary teeth play a big role in a person’s dental health well into their adult years. Primary teeth serve two needs for a child: enabling them to eat, speak and smile in the present; but more importantly, helping to guide the developing permanent teeth to erupt properly in the future. Without them, permanent teeth can come in misaligned, affecting dental function and appearance and increasing future treatment costs. That’s why we consider protecting primary teeth from decay a necessity for the sake of future dental health. Decay poses a real threat for children, especially an aggressive form known as early childhood caries (ECC). ECC can quickly decimate primary teeth because of their thinner enamel. There are ways you can help reduce the chances of ECC in your child’s teeth. Don’t allow them to drink throughout the day or to go to sleep at night with a bottle or “Sippy” cup filled with milk, formula, or even juice. 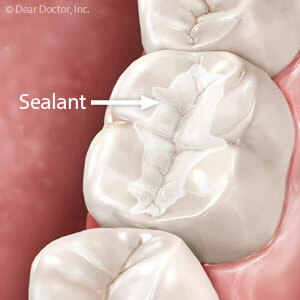 These liquids can contain sugars and acids that erode enamel and accelerate decay. You should also avoid sharing eating utensils with a baby or even kissing them on the mouth to avoid the transfer of disease-causing bacteria. And even before teeth appear, start cleaning their gums with a clean, wet cloth right after feeding. After teeth appear, begin brushing and flossing to reduce plaque, the main trigger for tooth decay. And you should also begin regular dental visits no later than their first birthday. Besides teeth cleanings and checkups for decay, your dentist has a number of measures like sealants or topical fluoride to protect at-risk teeth from disease. Helping primary teeth survive to their full lifespan is an important goal in pediatric dentistry. It’s the best strategy for having healthy permanent teeth and a bright dental health future.